We always joke that kids don’t need fancy toys to be happy. They just need some markers and a cardboard box. 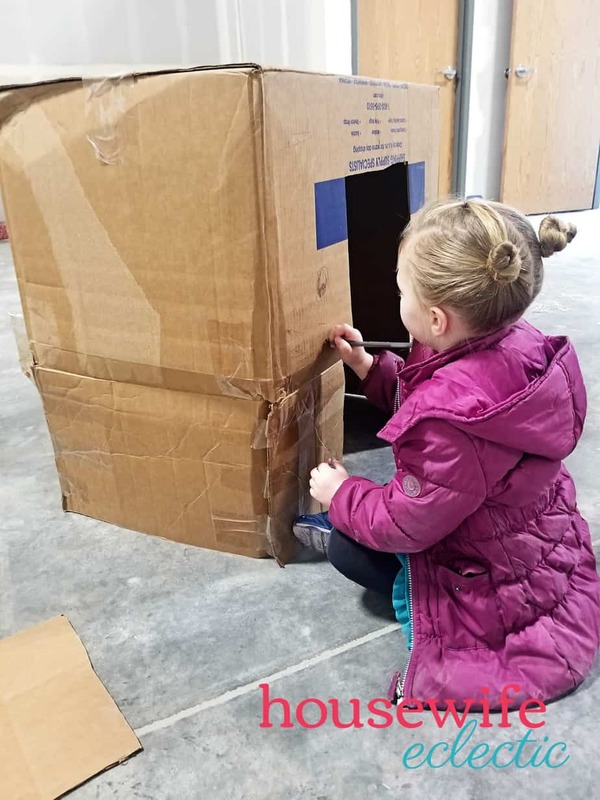 My kids have always loved turning cardboard boxes into cars, castles and other imaginative items. I absolutely love that they use their imagination to create their own fun. The last few weeks, I have gotten involved into turning boxes into toys and we have had SO. MUCH. FUN. 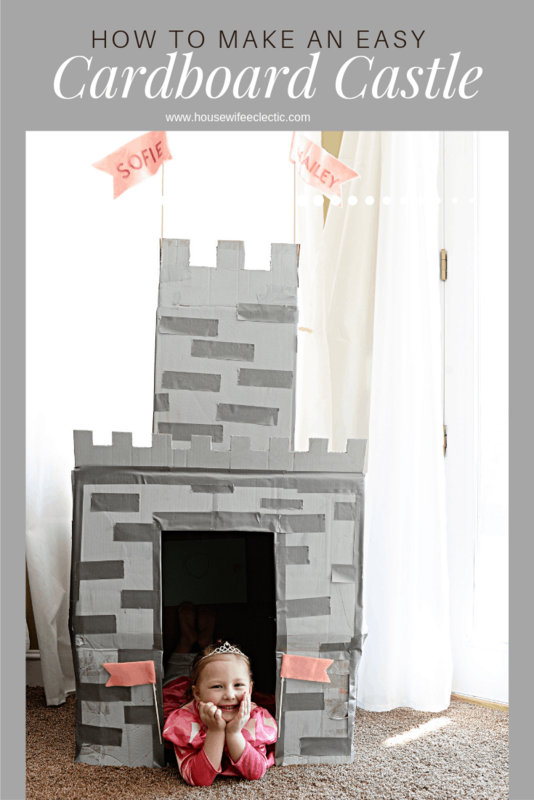 Today I am going to share how we turned a couple of simple boxes into a play castle in less than an hour. One of the hardest parts of making a cardboard castle is simply making sure that you have a tall enough box. I solved this problem by using a shorter box and duct taping the flaps into a standing position. This let us use the box we had on hand and still get the height we wanted. After you tape the box flaps up, cut out a door in the front of your box. Save the door to cut the square crennelations for the front of battlements. Tape the flaps of the box up on your smaller box and then use a knife to cut a 3×3 inch square out of the flaps every three inches to make the box look like battlements. 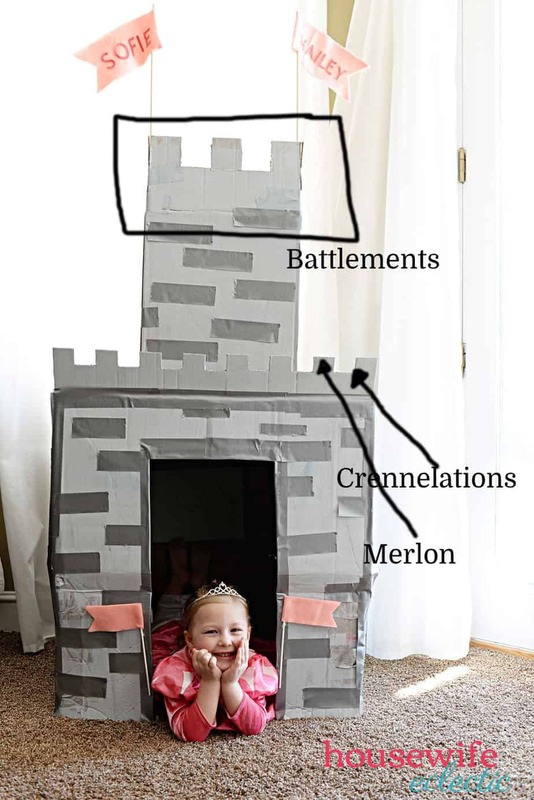 Do the same thing to your door and then duct tape the merlons onto the front of the larger box. Now that you have the basic structure of your castle. Paint the entire thing a light shade of grey. Make sure to paint it lighter than you duct tape. After the paint is dry, add stripes of duct tape all over the boxes to look like stones. Cut the flags out of felt, if you have a Cricut, you can use my cut files found here. If you don’t have a Cricut, you want to cut two strips of felt that are 20 inches long and 4 inches tall. After you cut them the right length, cut a triangle notch out of the end of each of them. Fold the flags in half over the top of a dowel and hot glue them in place. 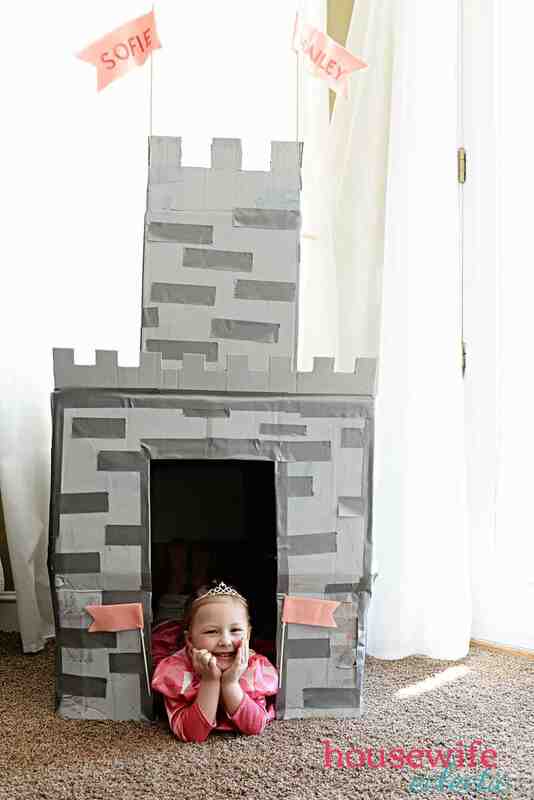 Use duct tape to secure them on the inside of your castle tower. You can repeat the process for the smaller flags making them 1 inch wide and about 5 inches long. What cardboard toys have you made?